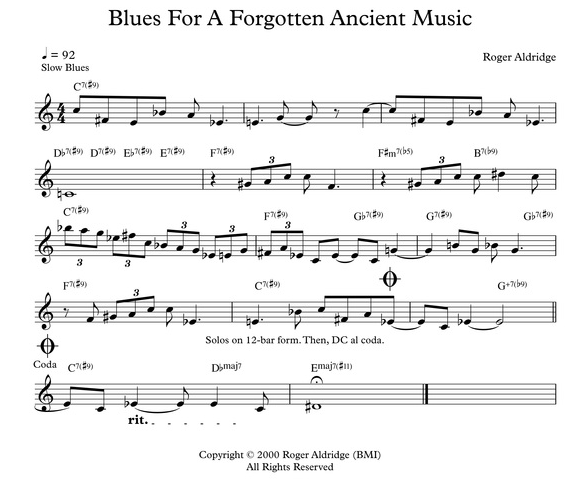 Blues For A Forgotten Ancient Music is a slow, soulful blues for those times when we need a slow, soulful blues. The title comes from a day when I was reflecting upon lost ancient civilizations and wondering about their music. Recorded by Jason Shapiro, tenor saxophone; E. Shawn Qaissaunee, guitar; Brian Howell, bass; and Skip Rohrich, drums. This is a fairly conventional 12-bar blues, however it has some quirks. The 4th bar has a sustained C in the melody with V7(#9) chords moving chromatically upwards against it. In terms of conventional harmony, the C is a "wrong note" on several of the chords (like the Db7). The ending, with a shift to major 7th chords, is unusual for a blues.